OK… This is a long one, I really hope all my artist friends grab a cuppa of strong coffee and take the time to read these morning thoughts 🙂 Back in 1983 I painted my first Valdres Rosemaling piece. I had been Rosemaling with many great teachers since 1975. Valdres though, I didn’t want to paint because it had flowers. Now, of course it is one of my favorite styles. Why? Flowers. LOL. This month we are releasing 3 new volumes to our Rosemaling inspiration series of books showing some inspired designs and new ways of doing things. I write all the time about “change” and how it not only fuels creativity, but also attracts new people to the market. I remember for years and years going to conventions and all the exhibitors would put up signs “NEW”…”NEW” then the customers would come to the show floor and ask “What is NEW”. One very difficult subject to talk to Rosemalers about is old vs. new. I understand that. One would think that Rosemaling is “traditional”, but when you look closely at its history, you see each style “changed” from artist to artist and through each design period. Why was Rosemaling so popular in the 1980’s and 1990’s then faded away? It was new to many people. Why did decorative painting grow so fast and then fade away? It was new. Why did people slowly lose interest in most forms of decorative painting and Rosemaling? I always come back to the same answer my teachers warned me about. Change. Early Rosemalers were always updating their styles to what was popular at the time. Today, we can look back and clearly see the evolution of the designs. For example, Ole Halstensen Sjoli updated the Osterdalen style through the Rococo, Louis XVI and Empire periods. He created many variations of Osterdalen. After his death in 1827, the style all but disappeared. Fresh ideas and creativity are necessary to keep painting styles alive. When the creators of a style passes, the style loses momentum unless there are powerful students and successors to carry on. Designs and styles move from one extreme to the other. For example, the fluid, fanciful style of the Rococo and Louis XVI era was followed by the strict lines of the Empire and Regency. Styles reversed again during the Impressionist movement of the later 19th century. So what was popular in one era, the opposite style is bound to become popular again in another design period. Change! When I started to paint in the 1970s, the styles were painted freehand, without a pattern. By the time bottle acrylics arrived in the middle 1980s, the styles had become more precise, mechanical and symmetrical. Perfect side loads and detailed line work were considered the mark of a professional, especially in the American Rogaland style. The styles had changed from freehand, to patterns and mechanics. I studied and perfected my mechanics, concentrating on stroke blending and perfect lines. Then the trend changed in the early 2000s and the decorative painting market started to collapse. It started to collapse because we didn’t change with the trend. The trend was returning back to “freehand” art. People change and art needs to change too. Why does “plein air” become more popular? THOUSANDS go to those conventions each year and the decorative painting industry has collapsed. Why, Fun…. Grab some paint, a couple brushes and go paint something. You don’t need to take the time to basecoat and put on a pattern. With this in mind, I began to relax the lines in Rosemaling. I created “casual” styles of painting. I switched from stiff synthetic brushes to the softer fusion brushes. These synthetic squirrel hair brushes do not allow precise strokes. 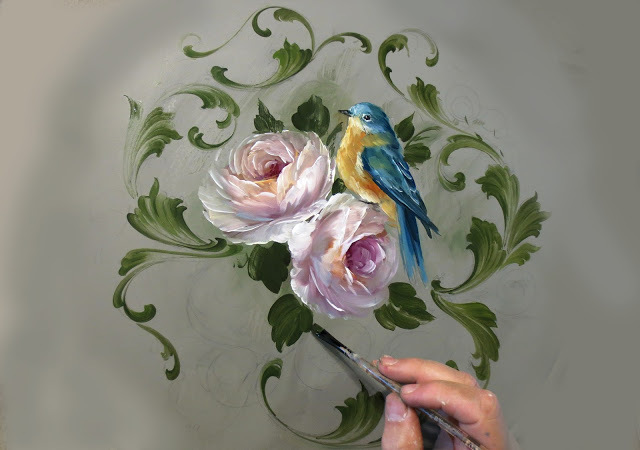 Squirrel and cow hair brushes are the earliest brushes used in Rosemaling. I returned to painting freehand and limited my palette colors. Start designs with “sketches” and not patterns. The majority of my students embraced this new method. The old structured way was no longer fun. I was returning to the free hand method of creating and allowing each artist to express their individual style. It takes practice and courage to paint freehand, but it is the key to making the style grow and change. Today, for me, the structure of the 90s has given way to more casual interpretations. I now look at the styles of Rosemaling and see where I can advance the looks, add more artistic principles and make a change. For this Valdres piece I added some additional concepts of “fine art” such as negative painting, harmony coloring, workup tones etc. It changed the approach to painting this style and I really love it. I worked the entire painting, all flowers at the same time and not one flower at a time. Not, basecoat, shadow and highlight. Some of you will embrace the change and some will not. It is ok! The change is to keep it interesting. Keep it fun!!!! To ALL my artistic friends who LOVE Folk Art as I do…. Let’s all take a really good look at the history of our art. Be honest, where are the next generation of painters today? Why haven’t they embraced these time tested art forms, and made the necessary changes to attract the next generation of artist? History gives us the answers if we truly look. Today, in art universities, there is a push on “individualism”. The students are pushed to “create their own work”. Guess what…. they don’t use patterns. Decorative painters still do. When I started Rosemaling and sat in my first Telemark class in 1975, there was not a pattern. Just an idea, a style, a concept and a starting point. Let the paint flow and find the shapes. Rosemaling is PERFECT for artists today who are graduating from universities if we just return to a few principles that historical Rosemalers used when they created new styles of Rosemaling. WE GOT THIS! While writing the new Telemark Inspiration book the other day I thought it would be great to share just a few thoughts with those that might want to try something new. With this lesson from the book I talk about painting lost edges…. really lost edges.. 🙂 You can see in the photo on the right and bottom below the rose. This gives new looks, which is important for the growth and popularity of any style of painting. While I was writing however, I also discuss just how important it is for color movement. Don’t forget that, especially in Rosemaling inspired designs. 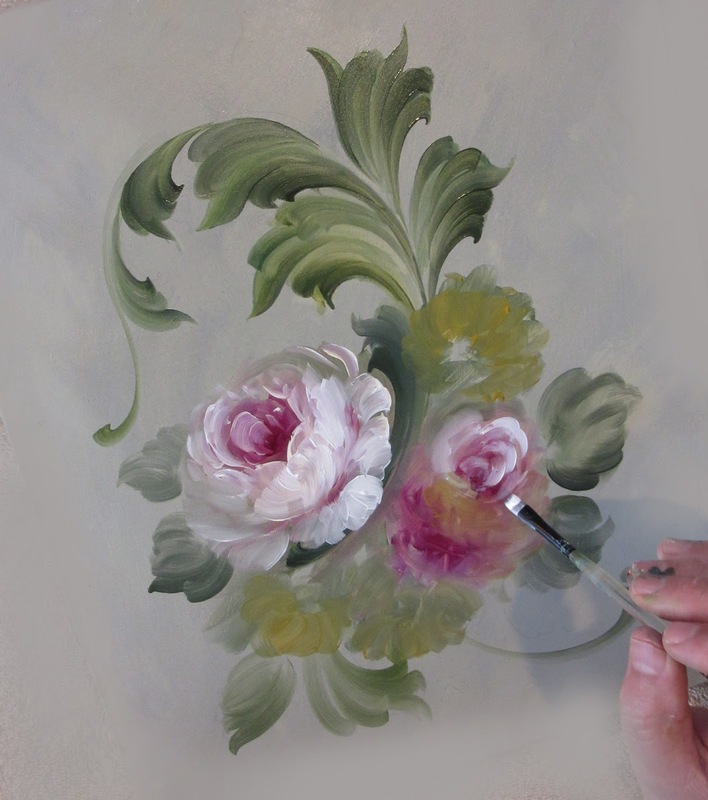 With Rosemaling, the power of the movement comes from the beautiful scrolls. That must always be respected in the design. 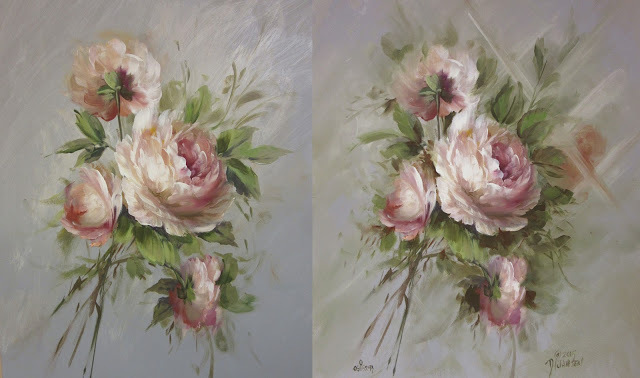 When I painted these roses right in the middle, I disrupt that movement which adds some form contrast, but can also create trouble for the design if you do not use color movement. How do I assist the scrolls? I take the reds (color of contrast) from the roses and move it softly through the scrolls. This simple little thing, increases the movement of the scrolls once again and also causes the viewers eye to travel through the color of the roses. WIthout the red orange strokes on the scrolls, the design would be heavy in the center with the color contrast. I really enjoy painting birds in different environments. 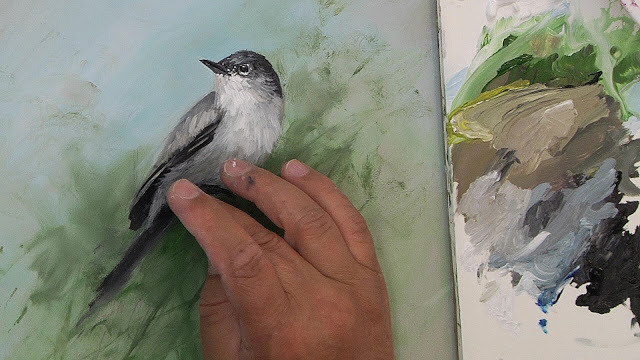 The key to making a successful painting is to establish a center of interest that revolves around the bird. Even a grey bird like the one above can have interest. Varying the colors from the warmer yellow green greys to the cooler blue greys will give him more interest. The most important aspect though is the use of stroke and textures. I will use many small textured strokes of various tones around the eye and beak and then soften them as I move down the body of the bird. This will pull the viewers eye to the face and then down the body. Lost edges are soft edges and are so very important in creating the mood of the painting. As you develop your style and look to your paintings always remember that lost edges create the mood. Notice in the photo above how the face and head of the bird “jump” off the background. This is because those areas are well defined. Outer areas and colors are lost. This helps define the story of my painting making the head of the bird the subject. Find a subject, then make a story around that subject. Create your art! The look of your painting is controlled by various factors. One very important one is the brush and its size. While many artists run to use many brushes, for most of my paintings I will use 2 or 3. This gives wonderful harmony to the techniques. 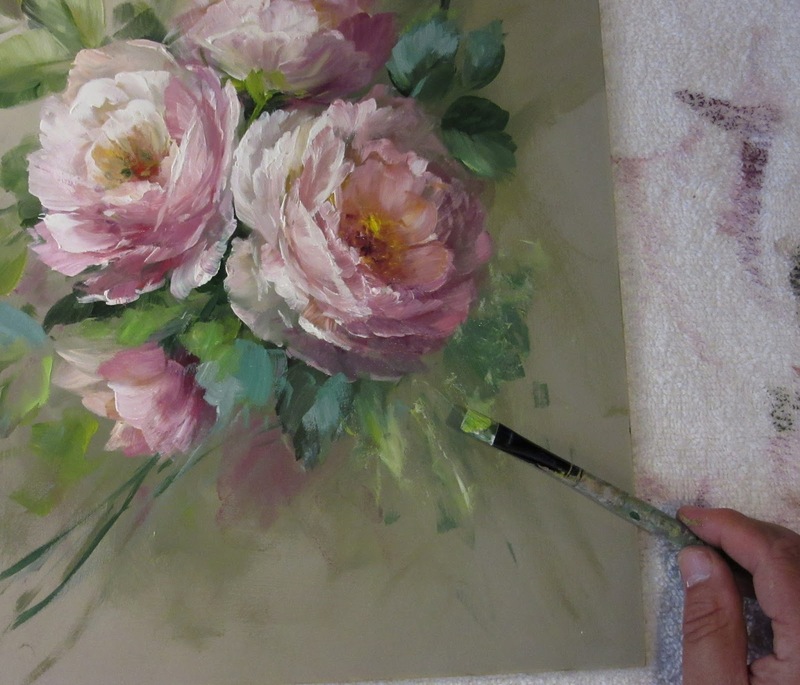 Painting a large rose for example with a small brush will give lots of stroke movement. Using that same brush to paint flowing scrolls will give that same movement and thus harmony in technique. Changing to different brushes within the painting can make objects appear disjointed. While we may desired many brushes in a landscape to show different objects and textures, it is not always wise in other genre. How many brushes and brush types you use can give more interest, and in many cases too much interest, and it can also give harmony. The artist must balance the choice because a rose painted with a # 4 will look different than one painted with a # 10. 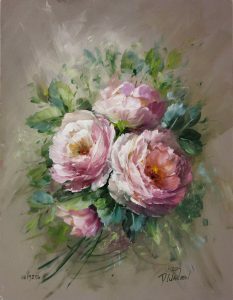 I will try many times when painting roses and scrolls to paint them both using the same size brush so while they have contrast of color and form, they have consistency in technique giving harmony to the painting. The choice of brush when painting scrolls and scroll leaves is essential. When I first started painting back in the 1970’s we used natural hair brushes. The natural hair “flows” with the movement of the hand giving less hard edges and a relaxed graceful movement to scroll work. In the 1980’s and 1990’s with the rise in popularity of acrylics, synthetic brushes became more popular. We all used them. While the synthetic brushes gave tremendous details because they “snap” to the movement of the hand, they could also make a design feel more “stiff”. At that time though, the use of patterns and precise detail were popular among painters. In 2005 we invented a brush for watercolor work. In 2008 we made it into filberts and eventually flats. The filberts and flats became popular among our alla prima acrylic painters. They gave more relaxed edges and flowed nicely with the movement of the hand. Not as stiff as a pure synthetic. The brush emulates the squirrel natural hair brushes so it sits between the stiffer synthetics and the natural hairs. I use this brush from almost all my paintings now. From scroll work to landscapes. The brush does make a difference. Just like carpet, tile, wood floors all feel different under your feet, different hairs and brushes will feel different in your hands. Grab one…. learn it, and control it. 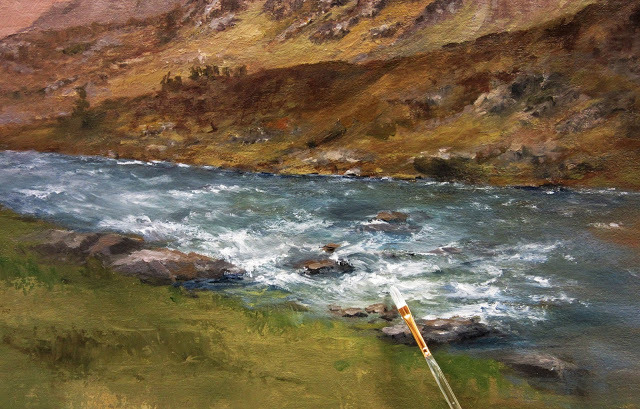 Reduce the number you are using and add greater harmony to your painting. Not every painting needs 15 brushes. Have a great painting day! 1 Bush- white color, 2 minute cloud. Fun! Painting is fun. No doubt about it. As an artist, I live in 2 worlds. 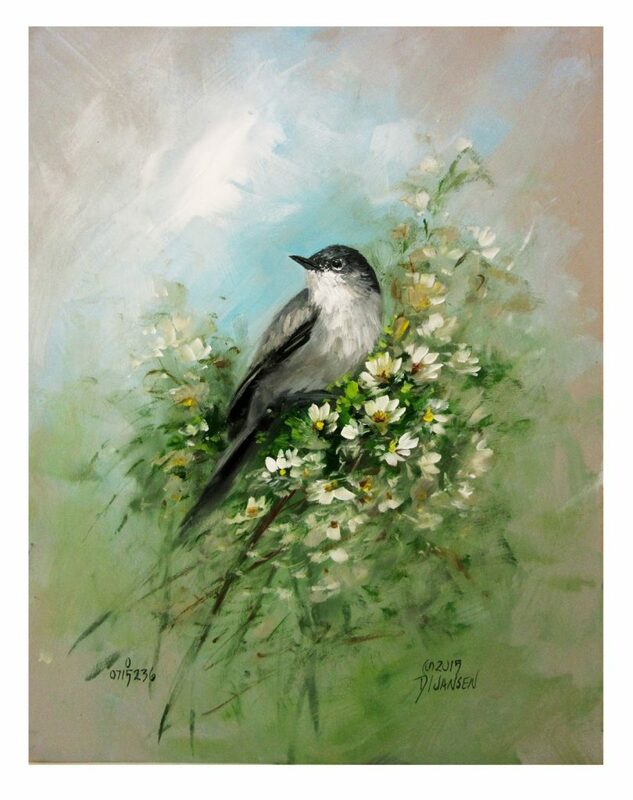 I have students and friends who do not have much time to paint, so I try to find fun, fast and easy ways to paint beautiful landscapes, wildlife, florals etc. My other world is the dedicated artist. Always looking to improve myself and my techniques and I drag a few people along with that journey. I love both worlds and my friends who live in both. Yesterday we released a fun little video on simple painting techniques. How to paint a two minute cloud. The video shows several techniques for more detailed clouds but there is something about 1 brush and understanding the movement that is so fun to paint. 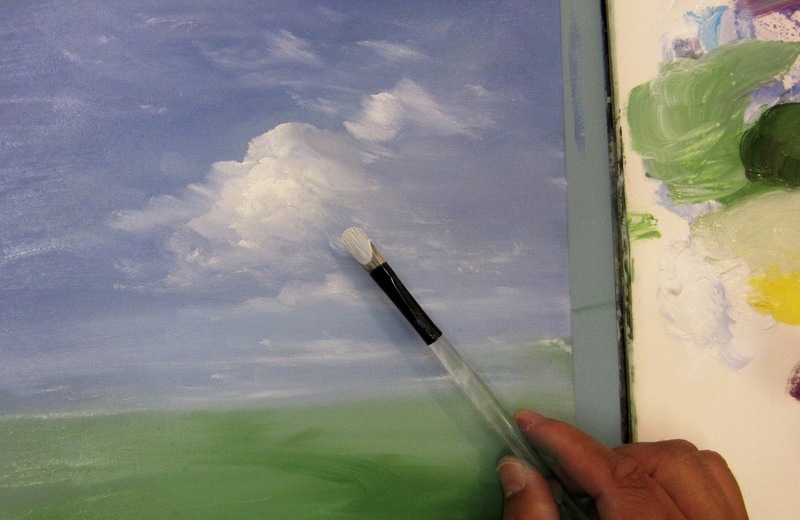 Once you understand, you can paint fun clouds very quickly in all sorts of paintings. Did I say they are fun to paint? 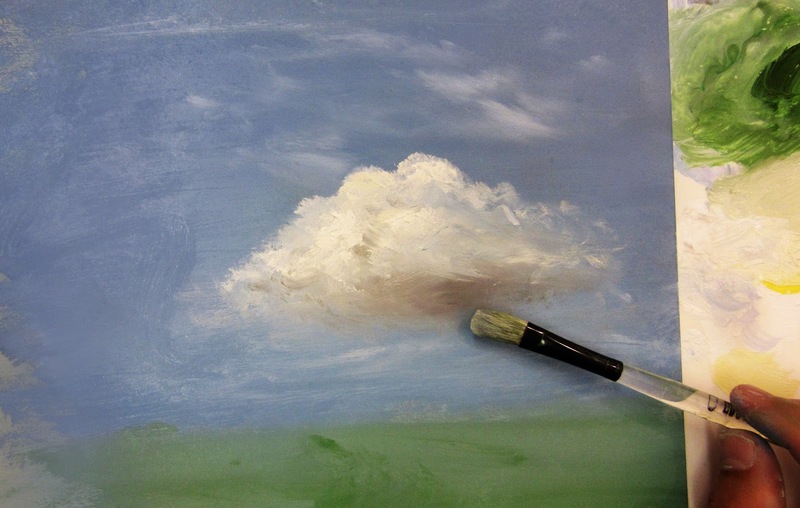 You can go over to our YouTube page ( https://www.youtube.com/watch?v=W0crvpK8Png) and watch a free 12 minute lesson on understanding the cloud, paint thickness etc so you can paint that little cloud in 2 minutes. Adding an embedded shadow in a cloud. FUN! The 30 Minute Painting Challenge… Change your brush! I have changed my brush so many times as an artist in the past 40 years. The one tool I use more than anything else is the 30 minute painting challenge. I require myself to paint a small painting, usually 11 X 14 inch within 30 minutes. This makes you move fast and casual. Keeps freshness to your brush. I use very thick Heritage acrylic paints and move..move move. Step one is to apply masses of colors. Add interest. Suggest through the colors where flowers might be. No need to be perfect. As a matter of fact, you don’t want to be perfect with the first colors. This keeps your brush moving. Next begin some contrast like I am doing in the photo on the left with the darker cooler green. Notice how the white flowers started out reds, greens and yellows. That is really white. No defined shapes… just movement. 2 months ago, I was studying another artist, he made one statement that changed my brush….. completely… “while many artists paint with lights and darks to achieve interest, I will use movement to tell my story”. Wow… so true.. I decided that even a static flower painting can have movement in the flowers and background. Turn the flowers in all directions, use powerful strokes of color that break the background and cause the eye to move. Now, how to add that to my brush….. lots and lots of 30 minute, small paintings that will cause me to see painting in new ways. If you want to see some of the painting I do in 30 minutes, head over to your YouTube channels. On my personal page https://www.youtube.com/user/JansenArtEducation I have some free ones and on our premium page I have about 20 there. Each time I want to learn a new concept, a new technique, I try it in a smaller…fast painting. This is a great tool that everyone needs to use. Small fast paintings help you break your habits and change your brush to do new things. They are so important. Give them a try! Here we have a couple of 30 minute paintings I painted in the studio yesterday as a study. Limited strokes. I will do most of the painting with my finger and then plan some movement with my brush. I have found that painting with the brush has more power of movement that painting with my finger, so I start many of my paintings by creating casual movement with my hands. Thank goodness for non toxic acrylics! Strokes have power. Lots of it. Use them wisely in your painting. Plan your work. Today, I will be painting with friends. 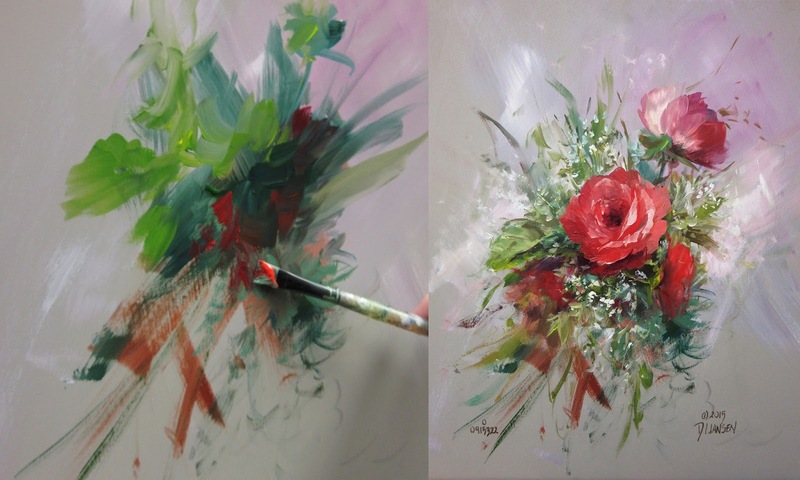 The challenge will be to paint a rose with your hand and brush, but, you can only use that brush for a few strokes. Painting with your hand and then the brush is a teaching and learning method. It works! This past few years I have used volume, speed and accuracy to teach new methods to paint. Repetitive painting (volume) teaches you direction. If you understand where you are going you will paint it better. You paint better when you know what is coming next. Speed keeps you from playing. If you are like me, you will play and play with the flowers until they all look the same. Give yourself 30 minutes to paint a group of flowers and you have to move! No time to make if perfect and guess what, it will have more life and energy. The key is to make all flowers different. Nature does. That can come very easy with speed. So I time my paintings. I don’t say it as a brag to everyone “look how fast I painted this”. I say it to keep my students from playing. If you are painting casual, move the brush! Taking all day to paint a rose is not a good thing. It means there is something you can’t see. Speed forces you through the rules, over and over until you can learn them. You learn through repetition. Speed increase the repetition. Accuracy… put a brush in my hand and give me 2 hours to paint and I will play and play… Put a brush in my hand, give me 30 minutes and I will paint fast and casual. That is me. Now, I add accuracy. I have a tendency to just stroke and stroke. So teachers limit the strokes. Today, I will do some paintings, allowing myself to only stroke a rose 10 times. I can use my finger as much as I want because it is more casual. But, the brush is powerful and for me instills a powerful stroke. So I have to be very careful where I place them. You can give the impression of flowers without painting too many petals. Look at these examples I painted yesterday in 30 minutes. But, I know me…. give you too much time with a brush and I will stroke everything…. so, break that habit. Allow yourself to paint a rose with only 10 strokes. This forces you to be very accurate with the placement of those strokes. You learn to not only see differently, but also relax your painting. It works… Can’t wait to go to the studio this morning and challenge my brush!!! Happy painting! Scraping Your Painting for Easier Painting. Many times I paint alla prima and breeze right through a painting. For this commissioned painting I will be putting a little more depth and interest and time into it. There is something fun about really getting into a painting that will be the center place display in someone’s home. So I take that extra few steps the satisfy the customer. The painting above is about 20% completed. It has its initial tones and movement establish but there is so much more to paint. 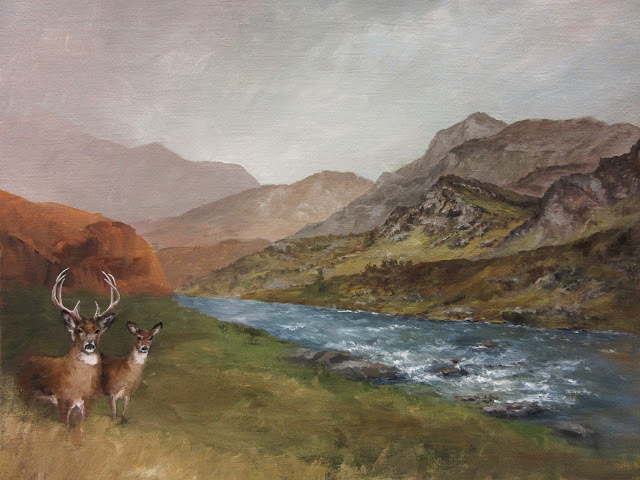 I have the first 2 focal area white tail deer blocked in, the initial movement to the stream and mountains have been established. I let the painting dry overnight, then I will scrap off the textures. This is a very old technique I first used in dutch paintings many years ago. It make a super flat surface for me to do the detailed work in the next layers. I love texture and this painting will have lots of it when I am finished. Having texture now, at the block in step is not a good idea because it interferes with later layers of the painting. So, let is dry and scrap off the texture. The surface after scrapping feels amazing. I will be able to refine the areas without any trouble. Think about adding this technique to your painting. It is amazing, especially if working in layers. Have great painting day. why I place red. I studied chemistry and physics in college, so I take the little I remember about it into the art world I live in now. Hue which is the property we call “color” is a “color appearance parameter” and used to describe a position of that color in light. Light is measured in wavelengths and degrees. The color red sits at 0 degrees in light. Green sits at 120, Blue at 240 etc. Since red sits at 0 degrees, that means in light it is at the top of the prism. After a good rain, check for the rainbow. 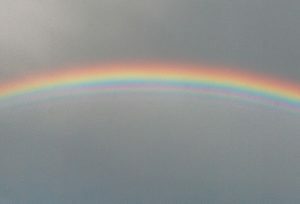 The water vapor will bend, or refract the light causing the rainbow. When this happens look at the positions of the colors.. ROYGBV red, orange, yellow, green, blue, violet. Red is at the top because it is at 0 degrees to the light. This is why in all the color theory I teach I place red at the top. It is the same thing nature does. Now I realize that yellow at the top makes a pretty wheel, but starting at the top with 0 and working around the wheel in degrees seems a little more natural thing to do. Just like nature. Artist are all different. We have different ways to do things. Whatever is at top doesn’t change the mixing theory. Just an interesting fact. Have a great painting day. I really enjoy painting all things, all styles. 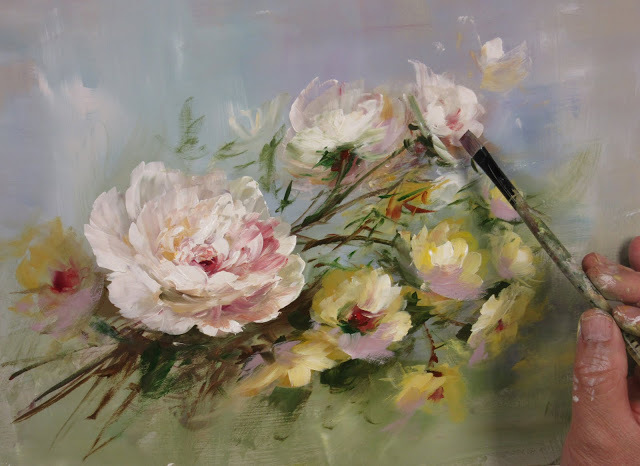 For years and years I wanted to be able to paint beautiful flowers. Lots of them. I studied history, artists, techniques to learn new ways. This was great, but it still didn’t help with me create my look to flowers. I painted for 20 years searching for that direction. In 1997 I started adding the Dutch Masters to my studies. That helped but still didn’t give me many new ideas. It did expand the looks though of my brush. I practiced and practice my flowers trying to make them correct. What I wasn’t practicing though it the “Art of Painting Them”. What is that?….. 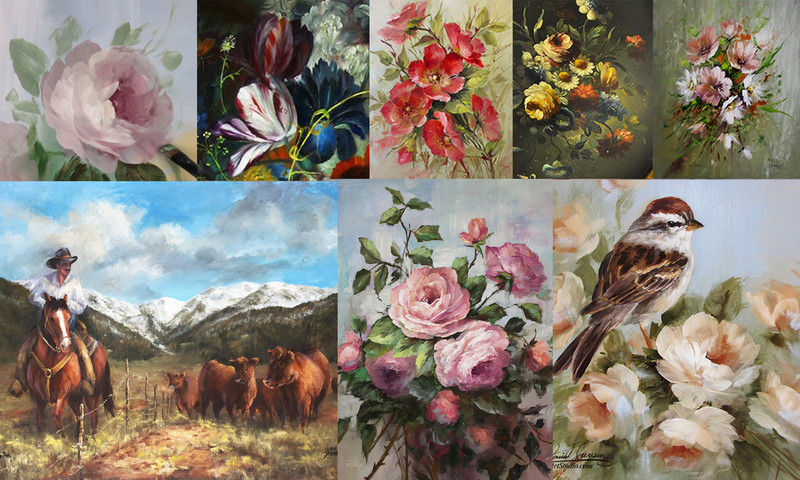 It is the secret to painting beautiful flowers, landscapes, scrolls, and just about everything. For years I thought to be a great Rosemaler or style artist, I must study and study those styles. Then one day, while studying Eugene Henri Cauchois (19th century French impressionist floral painter) I came across something that completely changed my thinking. 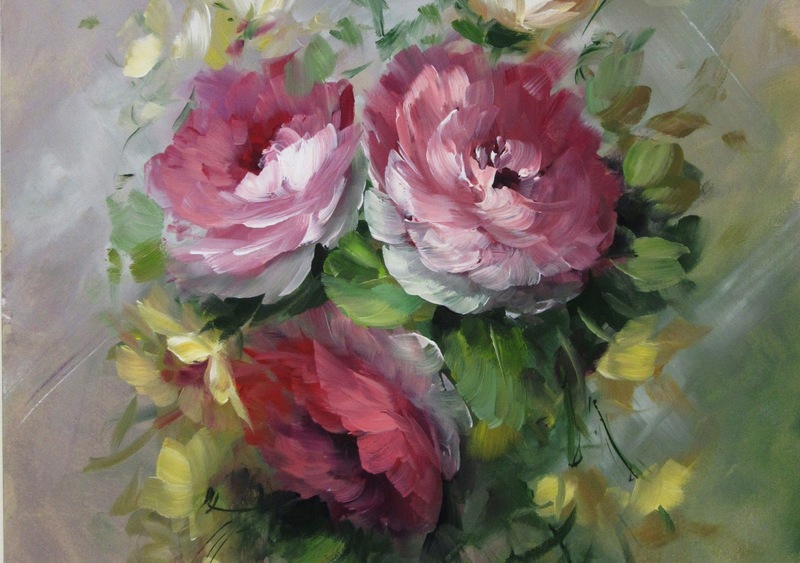 Halfway through his career as a floral painter he went to study with another artist. A portrait painter. You never see portraits by him but you do see a change in his compositions and skills. Why? He didn’t study the flowers to learn how to paint flowers. He knew that. He studied something new, a different art form, to change the way he painted his flowers. For the past 5 years I have done that. I have painted all the genre. Some I don’t enjoy. But, I paint them to change my brush. Break my habits and learn something new that will change my brush. This is what artists do! You study, not to copy styles, but to allow those styles to change your brush. I tell my students all the time, to create new ways to paint flowers, you must paint the seascape…. why? Because seascapes are different. That artists approach them differently. That difference give you ideas for flowers. When studying landscapes I learned about planes in the painting that set the depth. I use those techniques in my flowers. I now “see” flowers in planes. 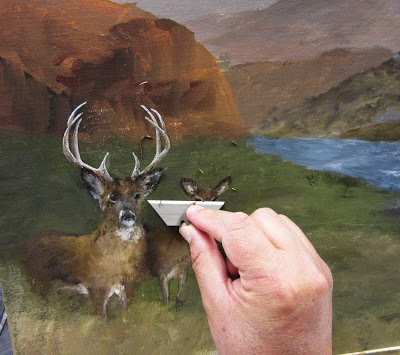 I would be doing that if I didn’t paint landscapes. The movement of the sea taught me just how important that stroke is. DON”T PLAY. Each stroke has so much power. Now, I paint more limited and paint with more power. Just like the sea. 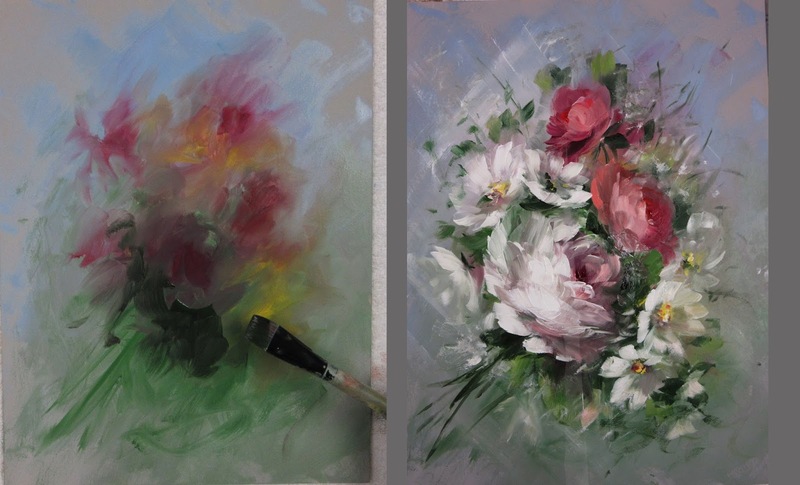 Of course study flowers, roses etc to paint them. Yes, learn the flower techniques. But, if you want more ideas on how to create new things, want to break bad habits, we must follow the artists before us. Study other things. Paint it all and more ideas come to you. Paint a seascape will break the bad habits you have with flowers because you use the brush differently and will become accustom to using it differently. That is the key! When I teach classes, or go to conventions, I will many times hear someone say… I don’t want to paint that. I don’t like that style…. Inside I say to myself, that is sad will never be an artist, you will not even be great at the thing you like to paint because your eyes only see one thing….. I never say that. That is limiting. When you make limiting statements, you limit your abilities as well. Expand your studies. Learn other ways to see and see it through an “artists” eyes. That is the key to painting. There are many ways to render a path of color. Learning only one is very limiting. In the last 5 years I have grown more as an artist than I did it the previous 30 years of painting because I paint all styles and genres now. I have more ideas. It works. Go paint what you don’t like and become an artist. Learn to see new things. Learn something different, then apply it to what you like. That is the secret. Don’t always study just what you like. I highly suggest you read the blogs of DeAnn and Brenda. The links are on the left side of my page. Read their thoughts and journeys. They have a lot to share as well. Have a great painting day! I am constantly reinventing myself as an artists. In this timeline you can see my journey. I started painting in 1977. I became a master in 1990 I thought I knew it all. Far from it. I learned that being a MDA was only a very small step in art. Very small. There was so much more to learn. So I started painting roses. By 1996 you can see the style I was doing. 3 front petals. ALL my roses had 3 front petals. ALWAYS…. In 2002 we were just beginning to use the Traditions and I was still trying to capture some new looks. By 2005 I learned better how to use the paint and tried even more new looks. In 2008 we developed Heritage and my abilities went up with the paint. Completely new Heritage system, new ways and new looks, so by 2010 I was able to now capture transparent petal looks and better use of warm and cools. I finally started to “see” roses and was getting better at capturing shapes. 2014 was the year I pushed speed painting and using a large brush to paint shapes differently. Trying to break old habits. By July of 2015 I can paint a nice rose in under 10 minutes. Use warm and cools, make a variety of petals….. not just 3 in the center. I have so enjoyed my journey. I have created a lot of nice paintings. 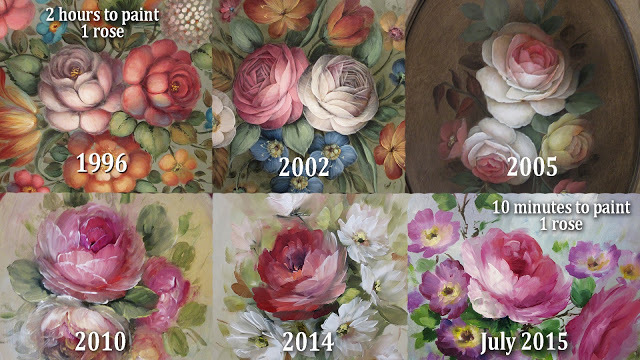 All the roses shown here (except july 2015) are hanging in my office at home. I look at them every day. I will add a new rose to this collection in a few years. When I change. I will change because each day I practice and try new things. That is my journey. I push myself with 30 minute paintings…. 1 or 2 brushes, limited palette. I push and push and push to try new things. I always change. That is my challenge to myself as an artists. I want to improve. Can I teach you to paint….. OF COURSE! I can show you all the problems and how to see roses, especially as I learn to see even more……. the only thing I can’t give you is desire. That you must provide. You have that, we can and will paint beautiful things. I don’t see a lot of change in painters today. I go to conventions and everything is the same ol thing….. basecoat shadow and highlight. Not there anymore. It was fun at one time, and I so enjoyed it because it allowed me to paint a rose in 1996. I am different today. I want to do new things and push myself to new levels of painting. What are we going to paint in the future??? Who knows! Hang on though, we are going for a ride and I have many new ideas and a paint that can do it. Each style I painted teaches me something different that I then take into other styles. 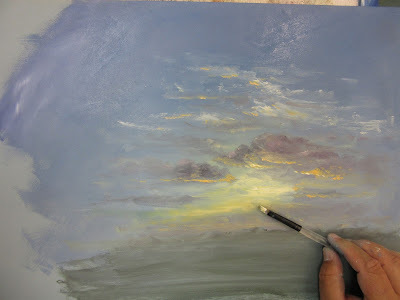 For example, I learn about holding my brush very flat and scrapping the surface to paint clouds in landscapes. I take that techniques into my roses to give them different looks. Today, I use my hand and brush in so many ways. The brush is just a tool for applying paint. I began using it only for strokes and my paintings were stiff and mechanical. Holding the brush in different ways, using your fingers, pushing the brush just as much as pulling the brush gives your painting more energy and life. I love it. When I first introduced these technique to my classes 6 years ago, so many had trouble with it. It really showed the habits we have as artists. Many times I will walk around the class and see everyone holding the brush in the same position throughout the painting. Everyone will use a different size brush, but then apply the paint with the same strokes. 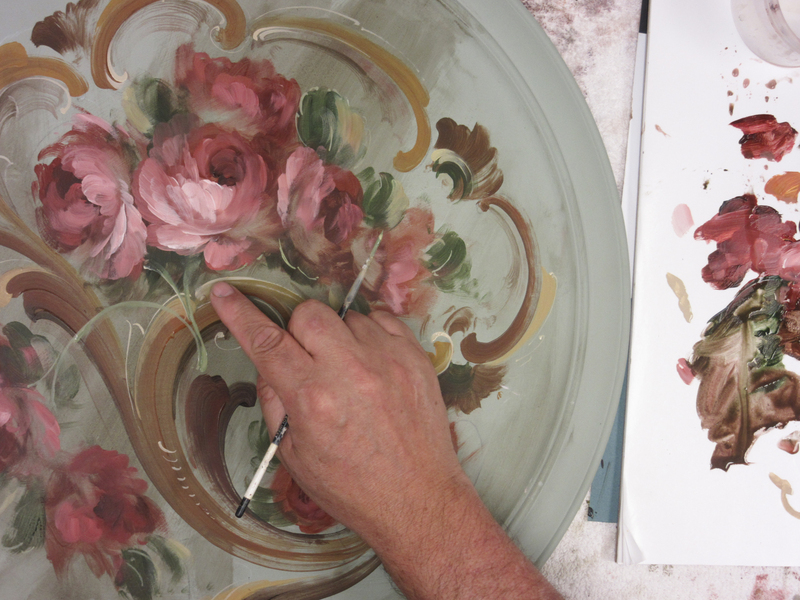 Painting beautiful objects is all about the movement of the color. Waves, leaves, petals and clouds. Movement. Using the same strokes to capture that movement makes all of the objects have the same look and thus less interest to your painting. Of course everything will look the same because you painted it the same. Add life and energy to your paintings by not only varying the colors, but vary how you apply those colors. 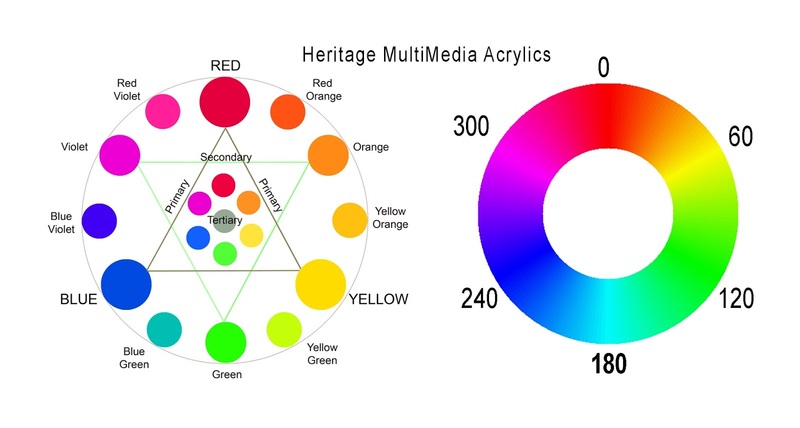 Look at each object independent of the others and vary how you apply the color passages to render the shapes. That is the key to making beautiful paintings. Holding the Brush Flat to Apply Painting with Different Motion. One question I have from my students all the time is how to paint things. How do I decide? Well, I am a professional artist. It is funny because most people think you can’t make a living as an artist. Well, they are wrong… really, really wrong, but you must do it correctly and professionally. You must follow the trends and diversify. You must constantly change. Art constantly changes. It runs in cycles. It has for thousands of years. 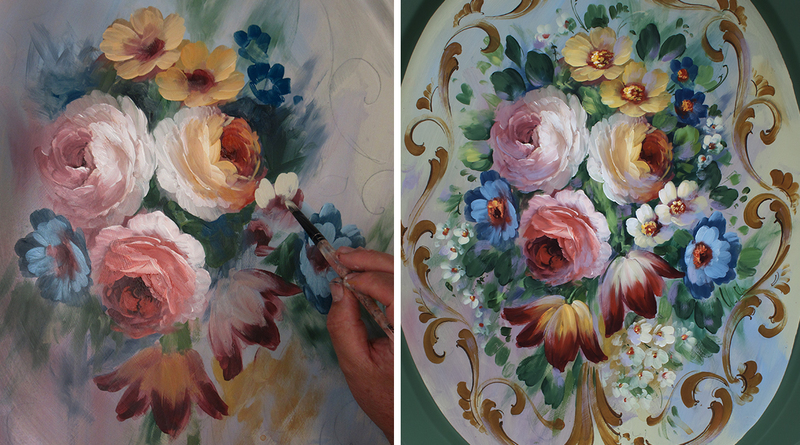 Even Rosemaling, my first love changed each design period from the Renaissance to Louis XVI. Each design period brought new ways of painting and “looks”. Today, some say they want “traditional” Rosemaling… Well, if you truly study the history of Rosemaling, there is no such thing as “Traditional”. Which Telemark is Traditional? Baroque, Rococo, Regency, Louis XVI and so on? It always changes. Art changes….. It is like Sigmund Aarseth wrote in his Rosemaling book in 1974… Rosemaling must change because society is not static. It always changes, so Rosemalers should change. That is so very, very true. I have been painting since 1975 and have seen so many changes. Artists that are still popular change with the industry. They create new looks and styles. I change… I have reinvented myself 5 times over the years and I am doing it again right now. I will always have my favorite styles to paint, but I must change to keep the art moving because society is not static. I must change to stay popular and sell my paintings. I see it all the time… In decorative painting one artist becomes very popular, then after 5 years, if they don’t change, no one paints that style any longer. Why? It isn’t because the paintings aren’t great, it is because society is not static. It changes. A funny example is James Bond, look how they made the movies in the 1960’s to how they do it today. This year they will produce I believe the 24th movie since Dr. No in 1962. He is still fighting SPECTRE but with different tools and completely different cinematography. Movies have changed, shoes have changed, watches, couches, water bottles… Everything changes. The entertainment of good vs. evil doesn’t change, but how they entertain us with that battle does. The idea of painting a rose will not change, because roses sell!!! 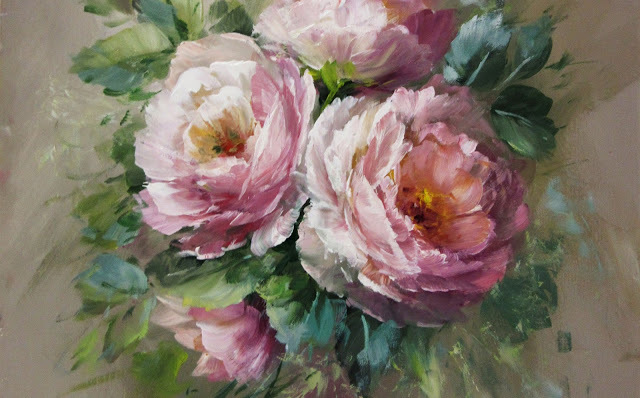 An artist must change how they presents the rose with new looks, colors and techniques that excite the market and make people want to learn and buy it. Change… it is important. So I change. I change to keep art exciting and fresh. I certainly love painting all styles and will bring some back in a few years. But that is not always successful. I loved the volkswagon bug, but they could successfully bring in back. Because society changes. I would still love to have one though.. Each artist must find their way. For me, I cannot compete with realism that digital photographers can bring to the art. So I don’t paint that any longer. Digital art is now huge in our market. So I must make my paintings look like paintings! I cannot compete with digital art, so I go a different direction. Give your paintings textures, strokes, powerful tones. They must be paintings and look like paintings. Look for what makes your paintings different from other things. So, I have moved to fast, alla prima, and other techniques that give me dramatic looks the digital artists cannot do. Perfect for the new generation acrylics. Digital arts cannot place a thick stroke of paint to make something come forward. I can. No more mop brushes, blending for me. Because digital art can do that. My art must be different because society changes. So I just completed a commissioned wildlife painting above. My third one this month. Why? it is a painting. You can see the movement of the brush and paint. 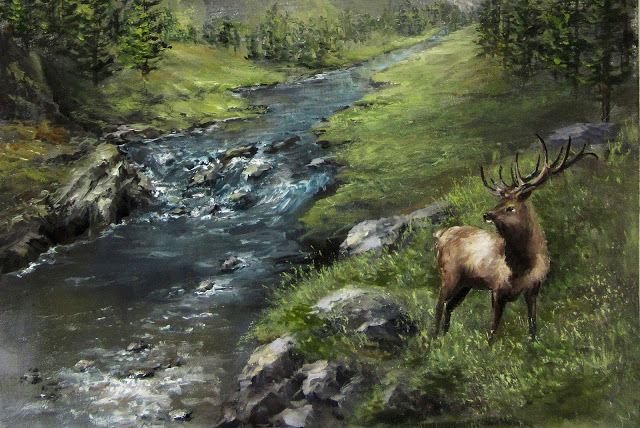 I don’t paint “real” elk. I make them a painted object within the scene. Rocks are painted with textures and heavy use of paint that provides another means of visual entertainment that other media cannot do. As an artist always look for what you can do that is unique. That is the key. That is what I do. I have so many new ideas for Rosemaling, strokes, scrolls, seascapes, etc…. So many, because I change, open my mind to new things and looks for ways that other digital industries cannot do. It is like I read on facebook earlier this year? Why go buy that painted rabbit at a craft store for $5 when I can paint it for $100 in supplies? Why can’t you sell craft items? Because so many can do it cheaper. Why can’t you sell paintings? Because they can print something cheaper. Make your work unique. Looks for techniques that are more difficult to produce. You can sell giclees of your art like I do, but, I know I am going the right direction when I sell more originals than I do prints… and I do! For many years in decorative painting I have struggled to find ways as an artist to add interest to my paintings. Interest can come in many ways. Rosemalers use the power and movement of the acanthus scroll. Your eye follows the line of the design and thus you find that line of movement “interesting”. In recent years as I added more painting genres I have added new ways to create interest in my work. 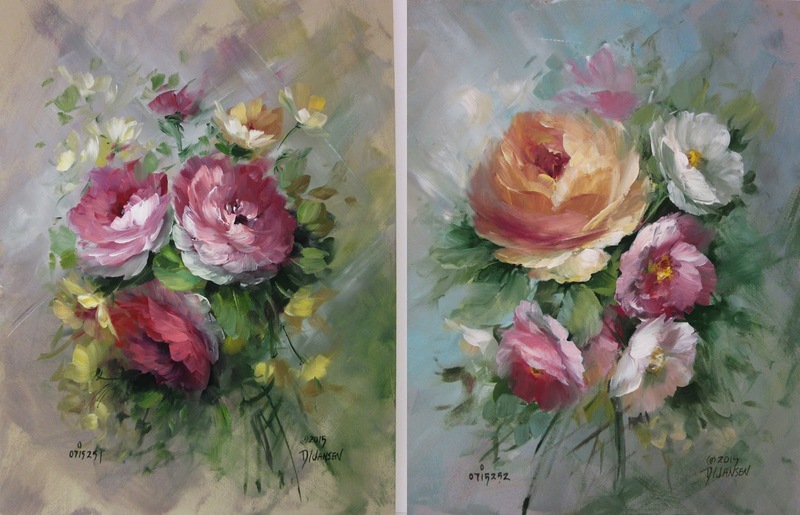 Studying the floral impressionists of the 19th century introduced the power of the lost and found edge, movement through the design through visual differences in the objects. This became my favorite way to paint for the past few years. I present paintings for my students and customers that take your eye on a visual journey through colors, form, and edges. The redpoll above is an example of this type of movement. The flowers in the center show more definition than flowers on the outside. 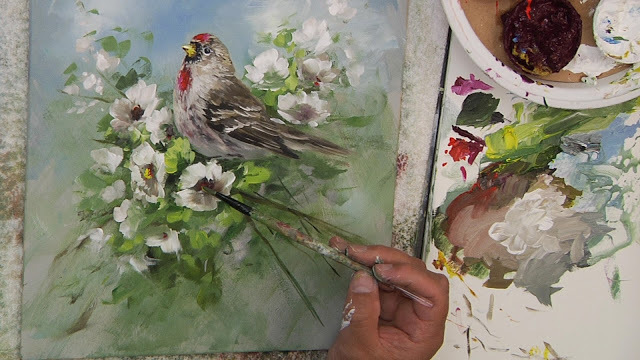 How much detail and how “real” you paint the redpoll also adds this visual interest. Reducing the edges, softening the effect pushes objects back and thus creates a visual journey for your eye and interest. Adding moving water to add interest. Action? It is true, I looked at his paintings and saw that everyone has some type of movement. It also had ways to tie the elements together that I never thought of before… so that is another post… more study…. Action…. His subjects were doing things. He has tonality to the colors, but then action in the painting. Movement. I guess this is why I like seascapes. The power and movement of water has always been a great subject for artists, but learning just how to control that movement and place it within the painting takes some study. My eyes are now really opening. I have thought interest as color, technique, contrast, subject and now action! Charles Marion Russell adding action to his painting for interest. 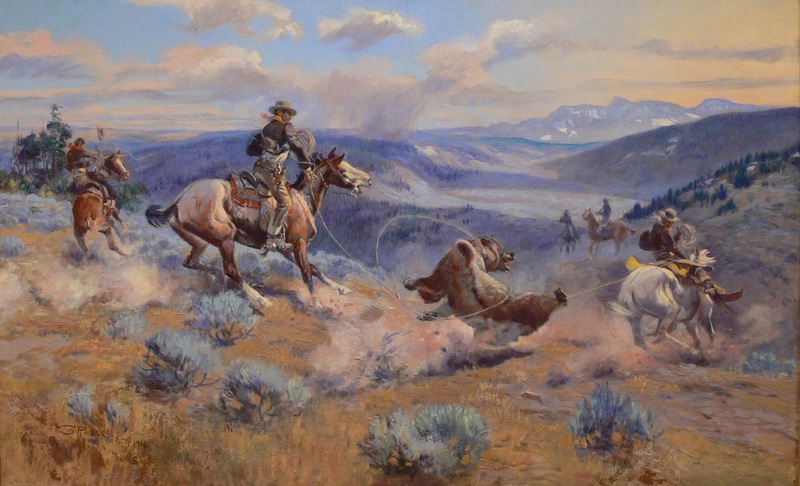 Charles Marion Russell as with most western genre artist added tremendous interest to his paintings with action. Movement of the subjects. Lots of movement. Lots of interest. Sometimes so much that you don’t travel the landscape part of the painting and stay mostly focused in the front. One artist I read said one of his paintings just didn’t have enough movement for interest, so he added rain to the scene. Thinking of natures movement rather than color movement. My eyes are opening further. I know not everyone will appreciate all genres and styles, but as a painter I find the “seeing” amazing. As I travel through the various styles and techniques I learn more and more about art and how to “see”. There are many reasons we all paint and create. Most do it for personal pleasure and fun. That is how I started. Later, I became interested in techniques. I found that I loved to “try” things, experiment and increase my understanding. As I try new things, I become more and more excited about my painting. I certainly don’t like all the genre and some I will never master, but I so love trying new things. Adding new things also broadens my appeal as an artist. For example, Dave Parmer who works in our business. A quiet, gentle, rock musician who takes care of our customers. He works, quietly editing our videos and packing orders. Only a couple of times in the last 7 years has he said he would like a painting I did, until this last week. I painted several commissioned wildlife paintings, using a different type of movement in the scene for interest. He came into the studio, saw them and said “MINE”. I said which one is your favorite…. “ALL OF THEM”…. LOL…. I was so happy. I reached him, a new generation. I said, I can teach you how to paint these, to which he said.. “that would be so cool!”. Now… that is why I paint and create. I just created something that appeals to someone and makes them want to give it a try. It is the greatest feeling in the world to create something that makes someone what to paint it. Your art is appreciated, and I have discovered over the years that you have to explore all types of interest to reach all types of people. Expand your techniques and types of interest and watch what happens….. It is fun! As artists, we are all different. I like to paint all things because I enjoy painting techniques more than I enjoy painting objects. Last night I had a few hours to paint before I had to go get Martha from work so I thought I would make a teaching painting. I enjoy passing on the ability to “see”. So I thought I would share some technique this morning with my blog readers. Let’s look at the left painting. For this painting I wanted to show just what subtle changes can do to the background and teach you to see. I started the painting as a warm grisaille painting. Light Grey and Yellow Oxide in the background. I then began the flowers adding warm and cool greys. This will keep them soft. I added a warm side (top) and cool side (bottom) to the center rose and then added the petals. The background is kept simple and the painting become soft. I took the picture. Now, let’s say you need to add more contrast to the painting, not a lot, but it needs some more. Do you add more light and dark colors to the rose? Yes, you can, that is the obvious way, but not always the way an artist will do it. What if the rose is perfect and you don’t want to change it? The artist then turn to the background because everything relates to the background. So, to add a little more contrast to the painting and make the rose a little more important in the painting, here are some things I changed. So I made the rose look different without changing anything in the rose. Here is what I did. 1. First you can see the lattice in the background. I also added a some impression of a back rose. 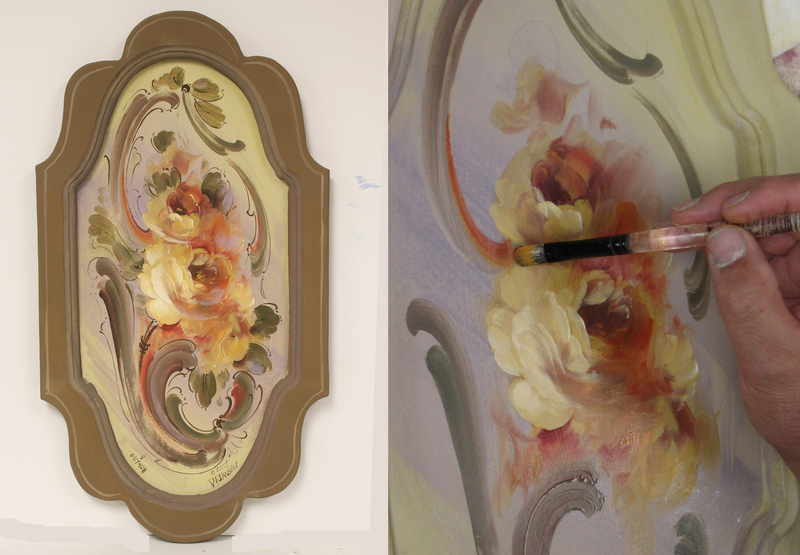 This give a little more dimension to the painting, push the main rose forward. 2. I added warm greens to the grey background. This also add more color variation, and although warming the background, it will also contrast the cool color in the center of the rose. Adding more negative darks around the bottom side of the main rose gives more petal definition and pushes the rose forward, increasing its contrast. I added subtle little dark tones around some flower, just a touch to “pop” them. For example the rose bud on the left side has a new touch of cool brown to the leaf. You see it? The bottom rose now has less distinctive leaves around it and some additions of dark tones to keep it off the background. But, by reducing the leaves, I force a little more interest to the main rose. Dark tone is applied all along the left edge of the main rose. Between the rose bud and the outside petals. Negative painting technique. The changes took me less than 10 minutes and changed the look of the painting. Which one is best? NOT IMPORTANT….. Learn how to control your painting and colors. Learn new things. See with new eyes. I really like my students to change my paintings in class. I teach for variation and how to make change, I don’t like to teach how to copy. So we have a change. Not a dramatic change, a subtle change. You can make even more, I make make the rose really pop, without touching it! That is what I am saying. There are many roads an artist can travel. That is the fun part! When you watch my DVDs, and read my books, listen closely to what I am saying. I like to teach how to do things. They are ideas, some you will like, some not, but that is not important. Learn how to control the painting and then you will be happier with what you paint and be able to paint what you like or others like. Have a great painting day! Time for something really different! This summer has been a summer for relaxing exploration with my brush. I have pushed myself in many new directions, opening new opportunities for myself, my painting friends and our studio business. The greatest joy though has been discovering so many other styles and techniques of painting. The painting above reflects just one new way of looking at a painting. For many years I would basecoat, shadow and highlight. I would slowly add interest to the painting as I added more color. One alla prima technique that I will be introducing in a new book soon does the opposite. It really works for me, and it is the most fun I have ever had as an artist. You begin by “splashing” some palette colors on the surface. Then through a process of warm and cool color application, you refine the areas into the subjects of your painting. Amazing technique. One Heritage team member I showed this to last week said… “you just killed all your decorative painting students, it is so unlike anything we have seen. How you going to teach this ?” But, do it once and you are hooked on the technique like I am. So much fun to splash color around and be creative. As an artist, I like to try new things. Not craft things, solid artistic challenges. I love techniques that make me frustrated because with that frustration comes learning. If I can do it easily, I am not learning. So, I push into wildlife, impressionism and many other subjects. This new direction has revitalized my brush in ways I wish I could describe. I am painting faster and better than I have at any time in my life. I am excited every day to get up and head to the studio to try these new things. I am dragging a few close friends along with me and it is nice to see them expanding their markets, receiving commissions for new work and finding new students. Growth is needed and art is the key. If you are not making time to paint, maybe you need to mix up the techniques a little. Splash some color around and build some new looks. Painting gives so much joy. Time to revitalize our love of painting with some fun new techniques! When I first started painting years ago, I was so afraid of making a mistake. I carefully tried to copy each color my teacher showed me. Now, years later, I realize that I could have relaxed a bit and I probably wouldn’t have become prematurely grey if I had done just that. It is only a bit of paint. When casually painting and exploring your painting technique, you need to say that to yourself several times. In the photo above, I am exploring the composition. As I begin the bottom accent flowers, I have no idea what tone they should be. So I start out in photo one with a soft grey color. In photo two I add some lights and realize that I have over stated the highlights which take away from the power of the center blossoms. It is only a bit of paint…. I removed and restated the lower accent blossoms in the third photo with some softer yellows. This carries the colors down. There is a difference between making mistakes and exploring the composition. To make beautiful paintings, an artist needs to try several things. Put on a bit of paint and see what it looks like. If it doesn’t work, take it off, or push it back down and state another tone. I do this all the time. It makes painting more relaxed, and your painting more casual. If nothing else works, then restate the area with your original background color….. in all things, keep it fun! Paintings are beautiful because they connect to the viewer in some way. I use a variety of techniques to make those connections. I am a pure technique painter. I am not talented like some say, I use techniques. Learned processes that anyone can use with the proper amount of practice and education. It takes time, it take practice. One technique I learned and practice this last year was an edging technique. It uses an older brush in many new ways. For this painting I use a variety of edges. 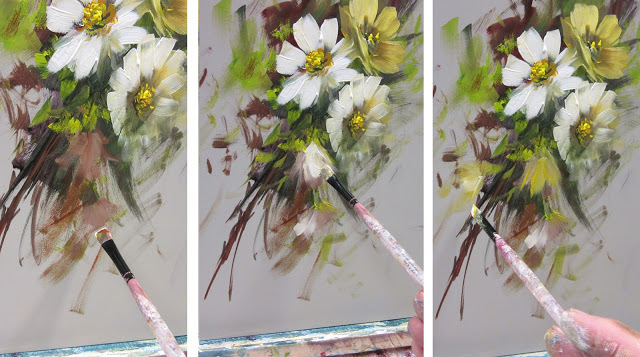 Some flowers have soft and lost edges while the stems use this new edging technique where I use the corner of the brush and push away. I also use the corner of the brush to add those details in the centers of the flowers. 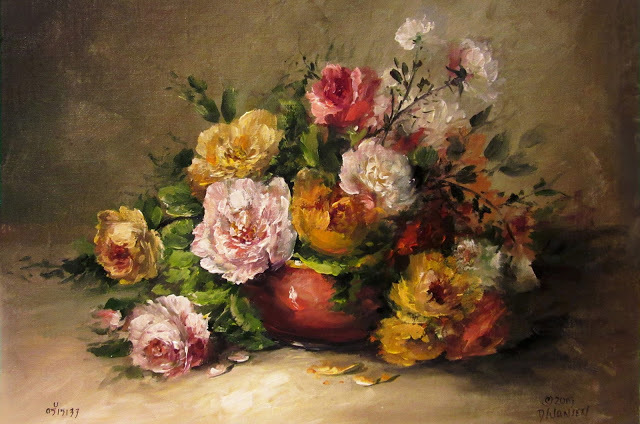 The contrast between the edgy stems and the softer flowers gives the different look I was looking for in the painting. As I have said many times, artists are painters of edges. Just where and how you place and use those edges gives you a variety of looks. You can have a variety of colors in the background, but you need to keep the edges soft so the color recede against the flowers. The more edges the flowers have, the more edges the background can have, but overall it is a relationship of edges that makes the painting work. I have found this last year that if I increase the edges in the stems, especially in the center of interest, I can place more color in the background. Many people email me and say they love my backgrounds. I do too….now…. It has been a road of trial and error to get the backgrounds to work with the painting elements. To give the background visual interest without distracting from the flowers. This is where the wonder stems come into play. Using the corner of the brush to capture some casual stems, with lots of edges, lifts the flowers off the background. Edges advance. They also contrast the flowers and give me the correct amount of visual interest I was looking for in this painting. Are they perfect stems? No…. then are fractured to create interest but also break the lines so they cause your eye to move on to other elements. How did I know to do this? Technique… Painting the stems with the corner of an old brush instead of the point of a round or liner. I learned a new way. Painting is all about the visual interest. How do you create that? As an artist, you should be in constant search for techniques. That is what I do. How do you create a new and interesting rose? Paint a seascape. Because painting a seascape makes you “see” shapes differently. Look back through my paintings this past 5 years and see how they have changed. Also notice I have added a larger variety to the things I create. This causes me to look at things different. The stems in the painting I talked about earlier, well I learned that from a landscape painter. I bought every one of his DVDs last year and then let his brush evolve mine. I didn’t copy his brush, but I needed his lessons, his knowledge and his eye to help change mine and add a new type of visual interest. I know many who stop studying and just try to do it themselves. That approach doesn’t work for me. I just get a mental block and can’t do a thing. I need the “spark” of ideas that come from other artists, both old and contemporary to cause me to think new things and new directions. I need the drive in the country to see new sights. I enjoy friends around a fire talking about painting and “sparking” each other with new ideas that you just can’t wait to try. I know now I will constantly change as an artist because I am in search of new visual interest. I will paint those 3 planes of a rock so I can see a rose different. I will paint causal scrolls so I understand the movement of water over rocks and in a churning ocean. It is all natures movement and all natures visual interest. 7 years ago I adapted a portrait technique to paint some roses in a new way. After the success of that painting, I found what I really like to do… discovery techniques and present them in new ways. I use paintings to convey those techniques, to you, but don’t limit them. That visual process to paint a rock can be applied to painting a rose like I did in this painting. I learned it however from painting a rock! It is all techniques and visual interest. To paint better…. paint it all, so you can see it all!